This would have been a great instrumental track, it has a nice euphoric-trance feel to it and even the video is oddly appealing. 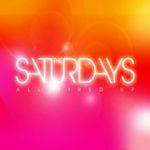 The only unnecessary thing is The Saturdays. They don't add much to the song, those few lyrics that they sing are dire anyway and their vocals feel so out of place (except for one brunette chick, I don't know her name). Barely 3* overall. This track is hot! Much better than Notorious. One of their best releases yet, and agree that the instrumental is great! Definitely their best to date. Never thought they'd be able to top Up, but they have! Dansant et pêchu, pourquoi pas après tout ? Solide Nummer, knappe bis klare 4*. i can see this hitting #1 in the uk (i hope it does). it's got a nice beat and a great sound. liking it, and compares favorably to the stuff off wordshaker. I really like it. I'm annoyed that Pixie Lott stole their chance of having their first #1 with this though. Much better than Notorious. Agree with Chemmical and Hijinx on this one. I know it's wrong but i actually think it's quite funny that they haven't hit #1 here, especially as in every interview they go on about it. Can't actually remember a girlgroup as big as them here that didn't at least have one #1. <br><br>They don't do themselves any favours though as this is better than Notorious so should have been lead off single and would have stood a better chance. IMO they have released two good tracks that would have deserved the top spot Ego and Missing You. 10th UK top 10. 12 weeks in the UK top 100. UK#3 and Ireland#6. 206,000 copies sold in the UK. Un énorme tube !! Parfait ! Also der macht schon sehr viel Spaß. Vielleicht durchaus nicht allzu weit weg vom Attribut "überproduziert" an einigen Stellen, aber bei mir wirkt es in diesem Fall doch. Und deshalb auch eine 5. The chorus is slightly catchy but the verses are just crap. ▒ Prima zaterdagavonddansplaat uit juli 2011 van de Engelse meiden: "Una Healy, Mollie King, Frankie Sandford, Vanessa White en Rochelle Wiseman", alias "The Saturdays" !!! Vet 4 sterren ☺!!! This did eventually grow on me, the loud generic production is still offputting but I got past it. I realised upon gathering my thoughts for this that it's kind of like a mini-"Give Me Everything" in the amount of catchy hooks/melodies it rotates through, right down to the 'keep me on your radar' outro; it also has a fairly interesting structure. It's a pity it's stuck with this instrumental but it does suit the track well. The video has cool visuals and looks like 500x the budget of "All About Tonight".